While we may still be basking in the 80-degree summer heat, fall is just around the corner, my friends, which can only mean one thing: an exciting lineup of new-season pieces to add to our wardrobes. We’re starting our autumnal prep with some seriously chic frocks that are perfectly on trend for the season ahead. From plaid prints to moody florals, polka dots, and prairie dresses, there’s a unique style for every sartorial taste this season. And because we know there’ll be plenty more items loading up in your virtual cart as the season progresses, we’ve ensured all our picks are at a favorable price point. So get ahead of the fall season with the chic dresses below. Checks in every form will be huge this fall. What is the unexpected hue cropping up everywhere for the new season? Fuchsia. 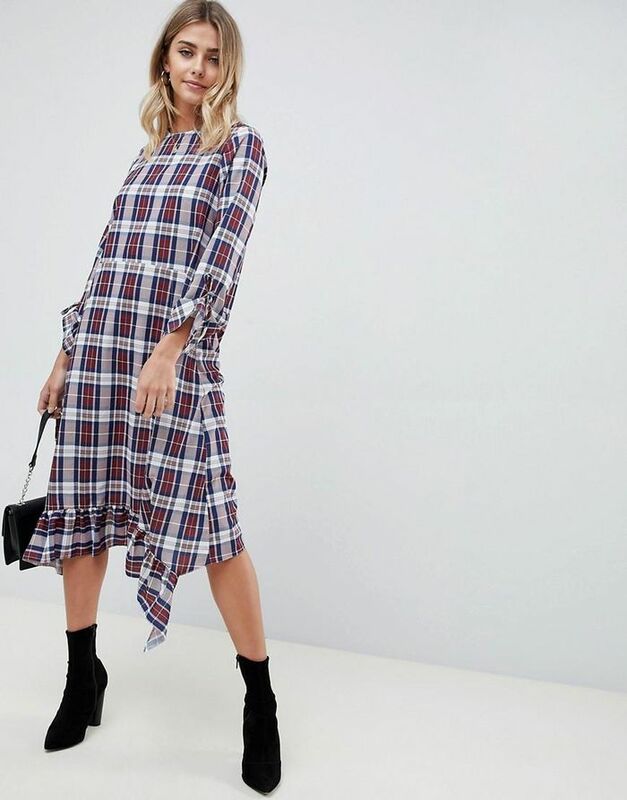 Topshop's almost always sold-out dress comes in a roaring new print. You’ll be seeing a lot more of the Wwestern trend in the next few months. Just add luxe autumnal brown accessories. Plus, the belt is so chic. Stand out from the crowd in poppy red. This looks much more expensive than it actually is. Feeling the glitzy ’80s trend that’s blowing up this fall? Then this dress is for you. Timeless and versatile, this can be worn from day to night. Puff shoulders, corseted waists, and sweeping skirts capture the new season’s prairie vibe. Wear with heels to the office and sneakers on the weekend. Because the season of plush velvet is back. A vintage silhouette in the perfect fall palette. Ideal for transitioning between seasons. Moody florals are a fall must. It’s no surprise that leather will be back on our radar for the new season. Layer a long-sleeve blouse under this chic pinafore. Score this super-affordable frock before it sells out. Classic polka dots are sticking around well into the cooler season. Wear yours in a pretty pastel hue. Because we all need a flattering and cozy ribbed midi dress once the cool temps roll around. A simple yet striking party dress for every fall and winter soirée. We love the chic details on this cool-girl frock. The heritage print deserves a space in your new-season closet. Up next: six fall trends I can’t wait to wear.